The semester is over for my ENG 4U class, and now I have time for reflection. Tania Meldrum and I decided to offer an English PD Day Workshop Friday, February 15th about our experience with Grade 12 Blogging and Talking in the classroom. I often decide to give workshops because they force me to think and to reflect, and perhaps, because of my latent masochistic tendencies. Our English Head, Kim Mendham, made the insightful decision to include blogging as the summative task for grade 12 English, so I began researching and thinking about the purpose and how to plan my instruction. I read this really interesting article about the Language of the blogosphere and a study that was conducted on articulation in this medium. 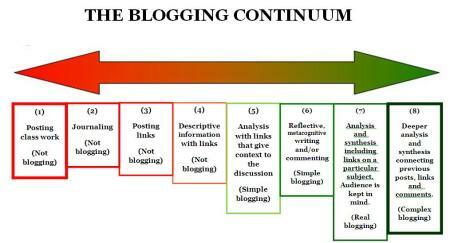 This is what prompted me to think of blogging as a form of dialogue with delay. It is a conversation with pauses for critical thought and careful composition. Much of today’s media texts are interactive sound bites of instant gratification. We then ask students in English classes to create texts that have a single audience member – the teacher – that are largely composed in isolation requiring lengthy investments of time. Blogging can be different, and done correctly develops critical thinking, patience for reflection, composition, and discussion. We then moved to having students create individual blogs using WordPress during our study of the novel, The Namesake. And then we worked to build a community of bloggers who could comment on one another’s posts outside of the classroom further to our classroom discussions on Hamlet. Finally for the summative blog, students worked in small study groups, brought their ideas into the classroom for further thought, development, and oral presentations. I decided to experience the act of blogging along with my students. I learned about the process, how much time it takes, and I discovered a secondary benefit to blogging. Having my students follow my posts on my blog allowed me to fill gaps missed in class discussions, to extend the discussion outside the classroom, and to provide links and support material for the course. They could read my posts the night before class, then we talked about the ideas in class; we had recursive discussions. Students learned critical thinking skills, concepts such as audience, and representation which became experiential. They talked about the experience as difficult, awkward at first, but they eventually found a way to represent their individual voices through words, images, research, links, and collaboration. Aside | This entry was posted in Literature and tagged Alberta, Blog, Classroom, collaboration, Collaborative blog, critical thinking, discussion, education, high school English, Learning, media strand, Professional development, Recursion, representation, Student. Bookmark the permalink.